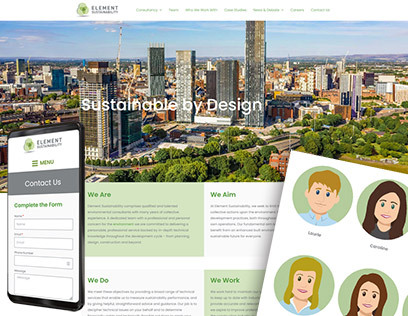 Consulting firm website design for a company in the sustainability sector based in Cheshire, UK. I completed the website redesign in WordPress so that pages and the news section can be updated in-house. Requirements included an animation and a continuous rotating carousel on the homepage. Illustrations were created for the team page of each employee, giving an approachable feel to the company. Element Sustainability came to me with inspiration for the animation on the homepage. I took their initial ideas and simplified them to keep loading time down. An animation was created that lasts about 10 seconds. It then repeats. A graphic designer was briefed for the illustrations. To keep the site accessible for 4G users I advised not to load the animation on the mobile site. The layout and page design were completely modernised and re-written by one of my content writers. The objective in design and content writing was to build a professional website that had a feel of approach-ability, which we definetly acheived. Our graphic designer provided illustrations for the 'Meet the Team' page, which expand to provide the user with more information on each staff member, as well as a small avatar size photograph.